What makes her a Girl Up champion both in and out of the pool? Her heart. Her determination. Her passion. Rebecca Soni made our country proud today by shattering the world record (yes, the record that she had only just set the night before!) in the 200-meter breaststroke, clocking in at 2:19.59 to win the gold. 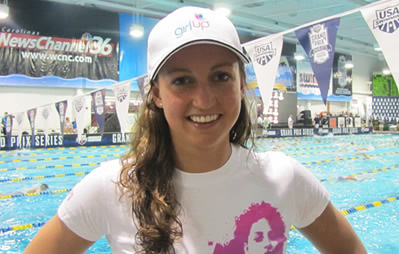 As the reigning gold medal winner in the event, Rebecca is the first swimmer in the history of the 200-meter women’s breaststroke to win the event twice. On Monday, Rebecca took home the silver in the 100-meter breaststroke. This decorated Olympian is not only a world record holder, but also a strong role model for girls. Believing that “where you are born should not dictate how big you can dream,” Rebecca joined UN Foundation’s Girl Up in 2010 to help improve the lives of adolescent girls in developing countries. As a Girl Up Champion, Rebecca has joined us at pep rallies and other mobilization events to motivate American girls to raise awareness and funds for United Nations programs that protect, educate and empower girls. As we watched the live stream of Rebecca’s race, the Girl Up team was overwhelmed with pride and excitement. We are all inspired by her and realized that this Champion is going to break the world record, just like she has helped break barriers for girls around the world.